Though this medal of achievement, nutrient-rich cookie filling, salad accessory and grill-able hunk of produce could only withstand the test of time as enduringly as your other displayed awards in its dried form, all good little boys and girls can go to bed knowing it will win any dance-off with visions of sugarplums in their heads. The sweetness of this fruit may actually stave-off sugary cravings and fill you up. Nutritionists FIGure a 100g serving provides approximately 20.3g of carbohydrates in addition to 1.3g of protein for only 80 calories. Now dash away! Dash away! Dash away all! FIGuratively speaking, even Adam and Eve knew there were jewels behind such fruits, forbidden or not. The exposed truth is the leaves of this Ficus tree aid in the treatment of diabetes by lowering the amount of insulin needed. There are also studies that prove fig leaves can lower the body’s triglyceride levels, so prepare your favorite fish wrapped in fig leaves or boil three in water for tea to remedy bronchitis, to benefit cardiovascular problems and fight high blood pressure. It would be a sin to lose your fig leaf. Size matters. Your tree can be added to the backyard or kept small and decorative if kept in a planter so, once the festive blinking tinsel tree is taken down, invest in going green in 2016! It’s a gift that’ll keep on giving. Dessert the healthy diet for just a moment in time. Truth can be but a FIGment of the imagination when one believes that more than a single small sliver of figgy pudding won’t outlast all time on the hips. With potential for 62+ grams of sugar- dependent on the recipe, indulge in one, then see it for what it is; dessert. Know when to call a fig a fig, and a trough a trough. Figs are most beneficial to the athlete when consumed in its freshest form. The 2016 Food Trend Predictions are Ripened for Picking! Check your pulses, and then check them twice! Registered dietitian nutritionist, Janet Helm, advises you make sure pulses — as in beans, dry peas, lentils and chickpeas, make your grocery list this year. The United Nations has declared 2016 the International Year of Pulses so toot! toot! your New Year’s party horns as you find your musical fruit packaged as simple, flavorful snacks. Also look for them baked into your naughty chips — making them nice, and new varieties of hummus made from different legumes, including edamame, white beans and red lentils that’ll have you asking, Where have you bean all my life?! 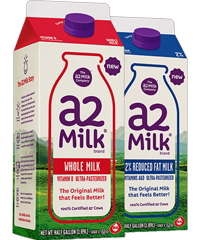 The a2 Milk Company™ from Australia has made a break through that is helping people who experienced discomfort when drinking ordinary cows’ milk. They discovered that ordinary cows produce milk with different beta-casein proteins, called A1 and A2. “Research has shown that A1 and A2 proteins digest differently. Current and growing scientific evidence supports that the different protein fragments produced have an impact on aspects of digestive function, and subsequent down-stream facets of human health.” (a2milk.com) Soon pouring into the US market, high quality a2 Milk™ is bringing relief to folks who previously couldn’t enjoy milk without the A1. Still on the fast tract of digestion related products, we’ll see many new drinks, including water, with added probiotics and prebiotics. As seen at the Academy of Nutrition and Dietetics’ 2015 Food and Nutrition Conference and Expo in Nashville, “A flavored water-based beverage called Go Live stashed the probiotics in the lid that will spill out into the bottle once it’s opened.” (Janet Helm, health.usnews.com) Individual packets of powdered probiotics and fiber to mix with water and smoothies will also bring relief from regular ol’ yogurt in the year to come. Bottoms up! Conservation initiatives ranging from composting to feeding the hungry to finding alternative uses to spent oil are finally important to the mainstream consumer and are being implemented by many companies in the food industry. “Dan Barber, chef-owner of Blue Hill, which has locations in New York City and Pocantico Hills, N.Y., has developed a program called wastED to work on finding uses for parts of food that would otherwise be thrown away.” (Bret Thorn, nrn.com) The sum of the parts are equal to the whole so chop those stems and add those vegetable scraps to your salad topping or juicer. And remember, nobody’s perfect, so let the misshapen or “ugly” produce go to your waist this year!